Even if you have undergone several surgeries in your lifetime, having an operation never stops being a major event. Many people underestimate the impact that surgery can have on them long after they’ve left the hospital. If anything is on their radars, it’s physical complications. While physical issues after surgery must be watched for a dealt with, the emotional side must not be neglected, either. Depression is common both before and after surgery. It can even show up after the diagnosis that indicates the need for surgery. Most of us have hectic, difficult lives as it is; add in learning that something is wrong, struggling with physically feeling bad, and worrying about how you’ll pay for everything, and anyone can find themselves in very low spirits. It can be especially difficult for people who already struggle with depression. In today’s blog, we’re going to examine the signs of depression and what can be done. When you physically feel bad, it is hard to keep your emotions up. It’s not a surprise. The struggle here is differentiating what is physical and what is depression. Too many people assume the misery they’re experiencing is simply an effect of their physical condition. We don’t blame them: there are many parallels between what happens during surgery recovery and depression. Fatigue, irritability, listlessness … they all show up in both places. So how do you tell the difference? As you can see, some of depression’s symptoms are physical, including sleep patterns, appetite, and energy. These aspects are also affected by illness and surgery, so how do you tell the difference? Well, if you know there are physical reasons for what you’re experiencing but you’re also struggling with the emotional issues in the list above, it is time to be assessed by a mental health professional. When you enter the world of physical troubles, it can be hard to stay away from depression. Stress, dismaying diagnoses, chronic pain, dramatic lifestyle changes, and shortened life expectancy can really get you down. The situation can be tougher for people with depression running in their families. If you or someone you love has experienced the symptoms above for longer than two weeks, it’s time to get help. The main way to identify depression is the lack of improvement. Two weeks is generally enough time for the fatigue and emotional turmoil of surgery to lighten, and if things aren’t looking up at all, something more is going on. At this point, it is important not to wait and hope things will get better. Get help. Note: Heart surgery and depression. It isn’t understood, but there is a well-known link between depression and having open-heart surgery. 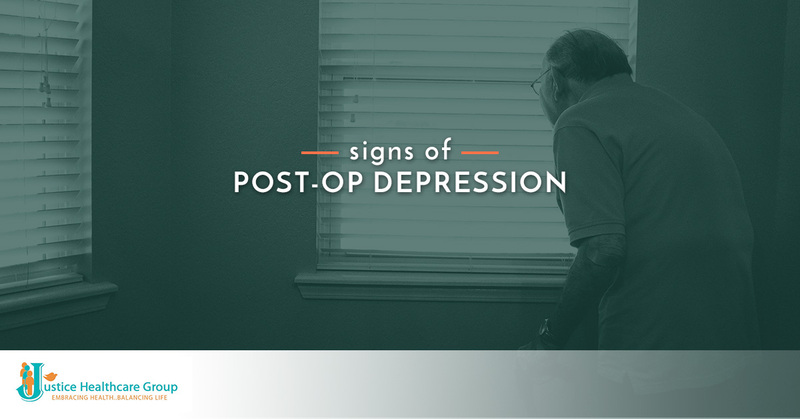 A majority of patients will experience extremely deep depression after their surgeries. This should never be taken lightly. Pursue treatment, including therapy, medication, and other solutions. The emotional and physical ups and downs of illnesses and their treatments are hard to handle alone. Whether you’re struggling yourself or trying to support a loved one, let our professional medical team help. We can provide everything from wound care to encouraging, compassionate companionship. Contact us for home health care in Houston today!